Last night, we met for a pot luck and gift exchange at Linda's beautiful hillside home in Brentwood. I brought a Costco pumpkin roll and noticed some other Costco products in the pot-luck; pretty sure the Kale salad was represented. For the gift exchange, Linda gave her yummy homemade toffee, MaryAnne, a wooden tray from the fine jewelry store Hudson Poole in Tuscaloosa (she's related to the owner), and Rose, a great discovery she found at Aldi. 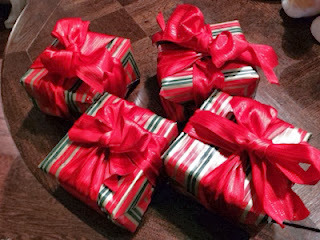 Of course, the gifts I gave came from Costco. 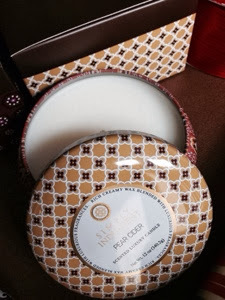 I saw a product very similar to these Simply Indulgent candles at Gilt.com on sale for $19.00 each, so $19.99 for three 12 oz. candles seemed like a great deal to me. The packaging is attractive and designed to make it easy to split into separate gifts. Every year Costco has some products like this that seem to be designed to split among several friends or coworkers. 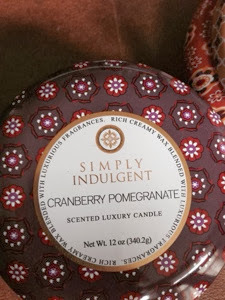 I like the metal containers, and the scents, pear-cider, sandalwood, and cranberry-pomegranate, are lovely. I think my friends liked them. What kind of wick is it ? ?